This month saw publication of the End-of-Year 2015 edition of the Enterprise Legal Management Trends Report by LexisNexis and CounselLink. 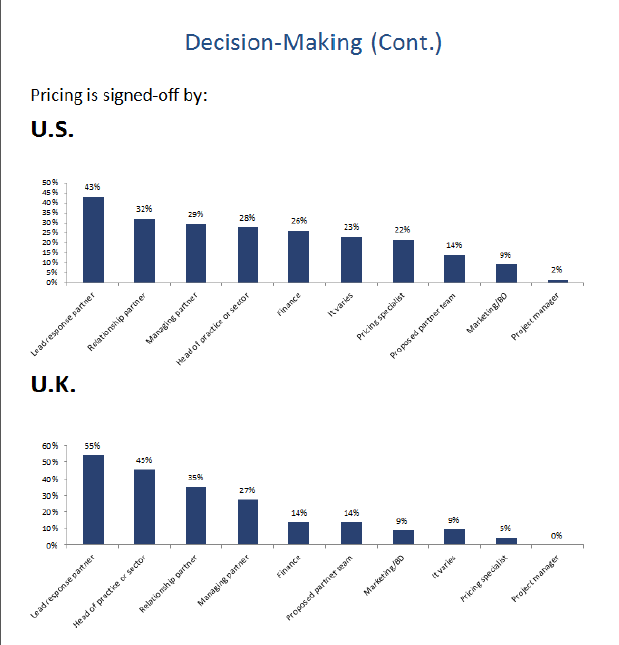 Based on data derived from outside counsel invoices – accounting for US$21 billion in legal spend in the USA – processed through the CounselLink platform, to my mind what makes this Report different to others is this: it provides insights others might miss because while talk can be cheap, the numbers rarely lie. From an Australian perspective, a couple of surprising statistics come out of this year’s Report. the use of AFAs, to govern the service payment of matters, only accounted for 9.4% of matters processed through the CounselLink platform. Given all the chatter and whining you hear from law firms, I would have expected this rate to be much, much higher. Employment and Labor (at 17.3%) is a fairly significant practice area leader in the number of matters (but not revenue – see below) using AFAs, but Real Estate accounting for something less than 2% of its practice area matters using AFAs seems out of whack. 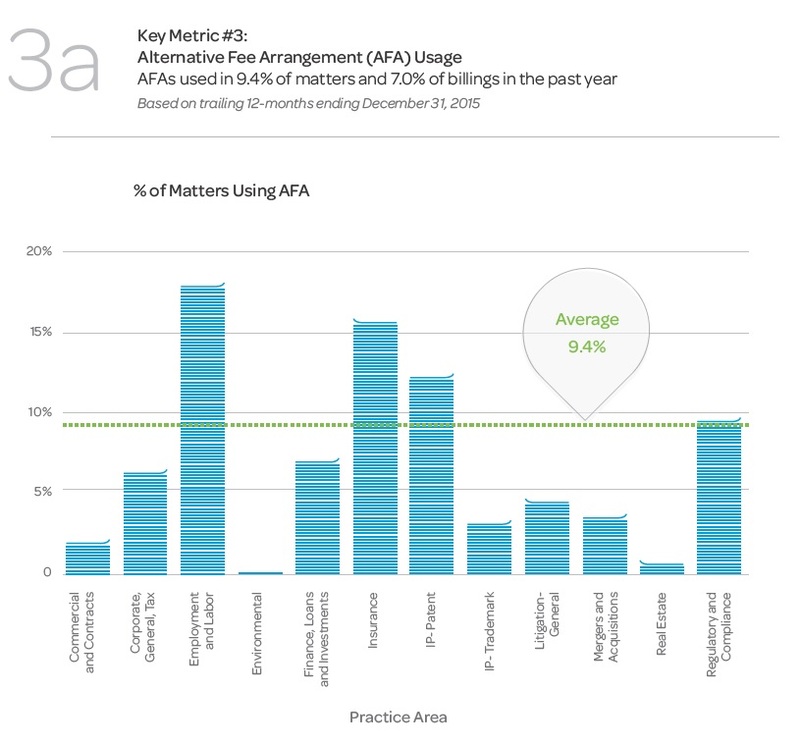 Nearly 10% of Regulatory and Compliance matters are done under AFA arrangements. At first this seemed a little strange (given the grey hair nature of the advice being sought), but then I thought a large number of compliance programs could be sold using retainers, fixed fees and other AFAs. Moving on to percentage of “billings” executed under AFAs and things start to get really interesting. 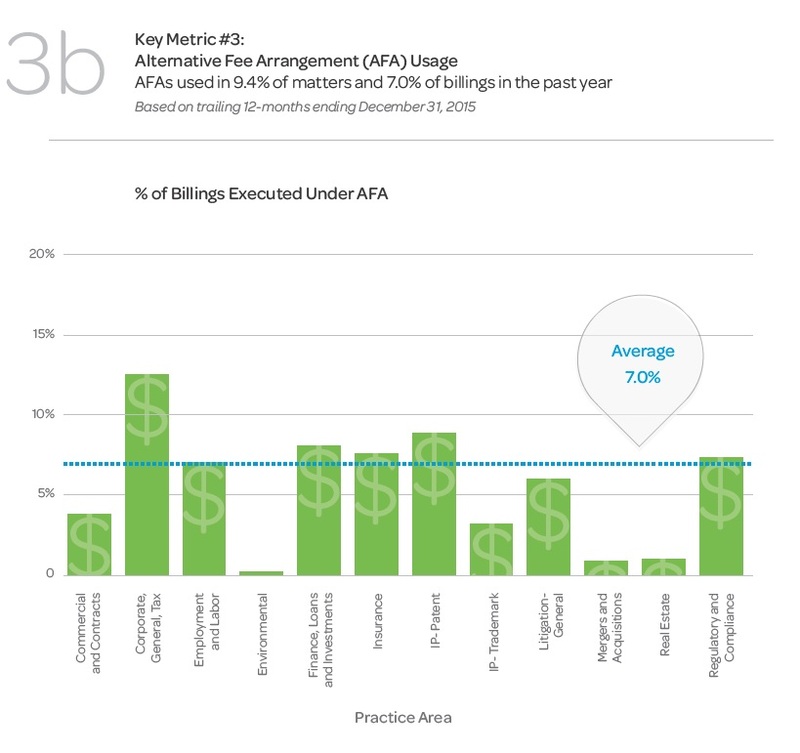 at 12.4%, by far the biggest practice area using AFAs by billings is Corporate, General and Tax (excluding Mergers and Acquisitions, which is a separate line entry). Not sure I would have guessed that. Finance, Loans and Investments ranked third highest practice area using AFAs by billings last year. Again, don’t think I would have picked that. 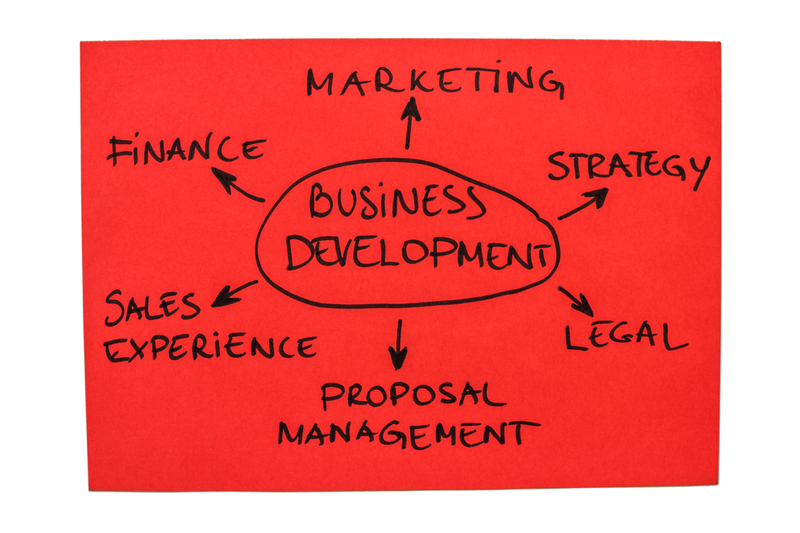 by billings, only 7% of Employment and Labor practice area matters are executed under AFAs. So, 17.3% of Employment and Labor matters were conducted under AFAs, but only 7% of billings. Might just be me, but that seems strange and I’d want to dig deeper into why that might be the case if my practice was showing these numbers. Then again, may just be the Pareto Theory in practice! 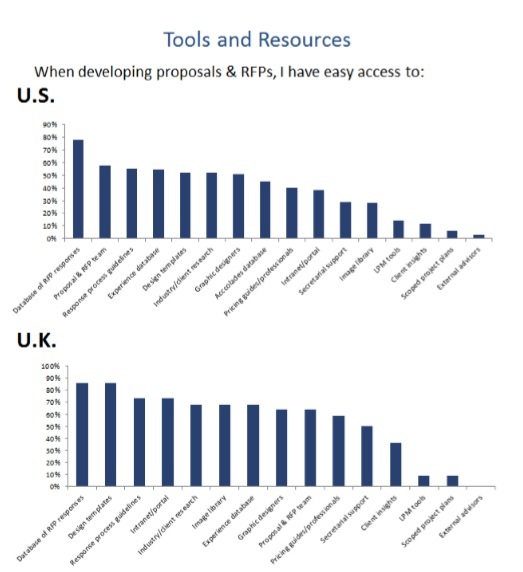 At roughly 2% of practice area billings, who says Real Estate has become a commoditized practice area? Because these numbers aren’t showing it. Interesting numbers showing through this Report. Lots of chatter around the rise in M&A activity/revenue and the fact that “New Law” isn’t being hired to do big ticket work, but the use of AFAs and rationalization of legal panels (which I may well blog on later this week) were my two big takeouts.